When you partner with Church Investors Fund, the interest paid on a loan goes back into our churches. Individual investors within our churches and their congregations invest in our fund in order to make the funds available to you. A Construction Loan is for an NAB organization with a building project. Once you have qualified for a loan, we will lock in a rate for you and give you 12 months to complete construction (this can easily be extended). During the construction period, you will only pay interest on funds used. You can write checks or electronically transfer funds in order to pay for bills related to the project; such as permits, contractors, etc. After the construction phase is completed the loan is transitioned into an "end loan" where principal and interest payments are due. We lend up to 80% of the total cost of most projects. A Straight Purchase Loan is for an NAB organization that is purchasing a building, land or wants to refinance a loan. We offer full, partial or interest only payments. We lend up to 80% of the total cost of most projects. A Renovation Loan is for an NAB organization that needs to renovate a building. Once you have qualified for a loan, we will lock in a rate for you and you will have 12 months to complete renovations (this can be extended). During the renovation period, you will only pay interest on funds used. You can write checks or electronically transfer funds in order to pay for bills related to the project; such as permits, contractors, etc. After the renovation phase is completed the loan is transitioned into an "end loan" where principal and interest payments are due. We lend up to 80% of the total cost of most projects. 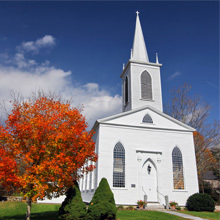 The purpose of a Line of Credit is to give the church additional flexibility in their financial planning. Once we agree to a credit limit, you may draw funds at any time by electronically transferring funds to your account or to suppliers or contractors. Plus, you only pay interest on the money you have actually used. The loan is secured by a mortgage on your property. Please call us at 1-800-543-2343 or email us for our current loan interest rates.